Wheelchair-bound students at Mill Green School can now experience the joys of a playground favourite thanks to a generous donation made by a children’s charity. As part of the Lansbury Avenue special school’s ongoing project to make improvements to its profound and multiple learning difficulties (PMLD) sensory garden, staff approached children’s charity of rugby, The Wooden Spoon Charity, who kindly agreed to grant the funds needed to purchase a wheelchair accessible swing. Provided by ‘GL Jones Playgrounds’ of Gwynedd, Wales, the swing was officially opened by the Mayor and Mayoress of St Helens, Councillor Pat Ireland and Lynn Glover. 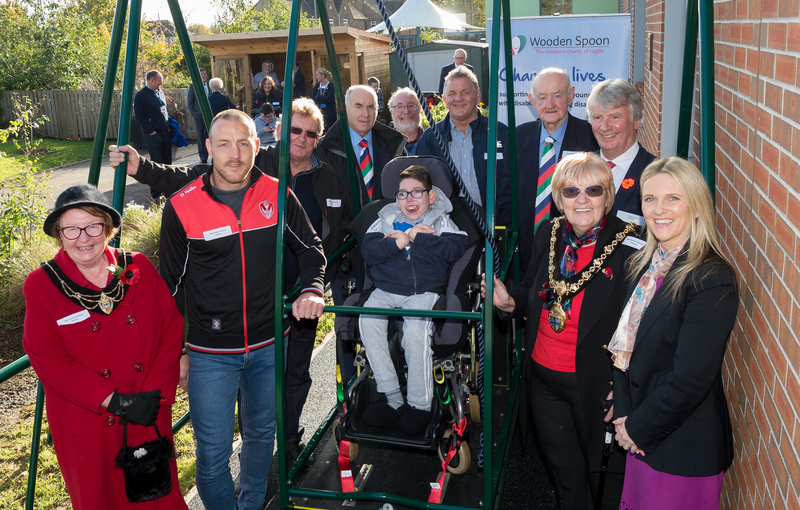 Joining them was St Helens R.F.C captain James Roby – while representatives from The Wooden Spoon Charity and parents were also in attendance to see students, many of whom had never had the opportunity to experience a swing before, use the specialist equipment. Commenting on how much of a difference it will make to the wellbeing of students, Headteacher Warren Brooks said: “To give our students this amazing opportunity we know it will not only benefit their experiences of play, but it will go a long way in aiding their communication, social and motor skills as well as their overall enjoyment during their time here at school.